Every Rosh Hashanah, on the first afternoon, a short while before sunset, I’ve been joining my community in the ritual of Tashlich (literally “to cast forth”). We go to a place of natural water (lakes, rivers or sea) where there are fish. Here in Bat Ayin, we all go to “The Ma’ayan” (Wellspring). There, we recite the prescribed prayer, including tehillim, meditate, and shake out the corners of our clothes. I have always loved the mellow meditative Tashlich ritual, without really being able to properly explain its meaning neither to myself, nor to my questioning students. This year I decided to face tashlich with more mindfulness. By researching the ritual of Tashlich and learning the lessons of the mysterious nature of water, I hope to discover the hidden depths of this ritual and heighten the awareness of Divinity innate within each of our hearts and souls. To keep the waters of the wellspring of Midreshet B’erot Bat Ayin flowing please click here. Our Yishuv Bat Ayin, “daughter of the eye or wellspring” flows with spirituality and prayer from its many wellsprings. Ba’al Haturim explains (Bereishit 16:7) that it is good to pray near water, as prayer is compared to water. “Pour out your heart like water before the face of G-d…” (Eicha 2:19). The fluidity of water represents change. After Adam was driven out from Eden, he repented by sitting by the river (Pirkey d'Rabbi Eliezer 20). In this way, he tried to maintain a link with the Garden. Water represents the womb of creation. Ego is the essence of permanence, while water is the essence of impermanence. Mayim- begins with the word Ma – What? We can nullify our ego with the question Ma – “What am I?” When we are willing to replace our ego with a question, then we are ready to be reborn with its answer. The Japanese water-crystal scientist, Masaru Emoto, found that the magnetic resonance of water is sensitive to our feelings and actions. Thus, he recommends that we avoid accumulating negative feelings, and that we recite blessings over our food and water. Rabbi Shlomo Carlebach notes that the creation of water is never even mentioned in the Torah. Water is a bit like before the creation of the world. This world is about duality, as it is created with the letter beit, which has the numerical value of two. Everything in this world comes in pairs: Heaven and Earth, Man and Woman, summer and winter, me and you, us and Hashem. In contrast, Hashem’s unity is reflected in the water. Water in Hebrew is always in the language of plural – mayim. There is no word for just one drop of water. If we place one drop of water next to a second drop of water, the first drop of water will make room to absorb the second drop of water, until they completely merge. All our mistakes derive from the fact that we live in a world of duality. They derive from the divisions of walls that separate between people – from the distance between man and G-d. Therefore, on Rosh Hashana afternoon we connect ourselves to the unity of Hashem through water. During the era of the prophets we would coronate kings next to the water for the sake of unity in Israel. Therefore, the day we crown Hashem king, we go down to the banks of water, in order to connect ourselves to the water, to connect ourselves to the great oneness of G-d, so apparent in the mystical properties of the water. (Rabbi Shlomo Carlebach, Lev Hashamayim, Rosh Hashana). ספר מיכה פרק ז: יט יָשׁוּב יְרַחֲמֵנוּ יִכְבּשׁ עֲוֹנֹתֵינוּ וְתַשְׁלִיךְ בִּמְצֻלוֹת יָם כָּל חַטֹּאתָם: Yashuv yerachameinu, yichbosh avonoteinu, veTashlich bimtzulot yam, kol chatotam. I remember my first Tashlich when I attended a Yeshiva in Jerusalem. We would go to a cistern and recite Tashlich over an open manhole surrounded by cobbles stones. No wonder that Tashlich didn’t hold much meaning for me then. Now, I have learned that it is preferable to recite Tashlich at a flowing, natural body of water preferable containing fish, located outside the city boundaries (Magen Avraham 583:5; Kitzur Shulchan Aruch 129:21). 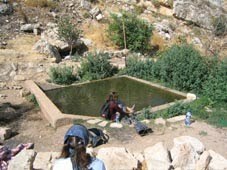 Going to the Ma’ayan (natural spring) in Bat Ayin fulfills all these requirements. There are even goldfish swimming in the heart of the spring. My husband remembers going with his family to a lake and throwing bread crumbs in the water. Many of my students are surprised that we do not practice this custom, which is not condoned in halacha. Several Sages, from the Maharil to the Aruch Hashulchan (Rabbi Yechiel Epstein, late 19th Century), including the Vilna Gaon prohibit the practice of casting bread into the water to be eaten by the fish or wildlife. The Shulchan Aruch writes (OC 497:2) that it is prohibited to feed animals on Yom Tov, lest one come to trap them. Furthermore, since the breadcrumbs are not needed for the holiday it is forbidden to carry the breadcrumbs outside the eruv. Perhaps, the custom of throwing bread into the water derives from people’s need to throw something tangible, rather than shaking out seemingly empty pockets. However, according to Ariza”l the shaking of our garments over the water symbolizes shaking away our spiritual kelipot, (husks).We shake out our pockets and the folds of our clothing three times during Tashlich in order to rid ourselves of any residue of sin. This practice also represents our heart's intention to cast away and be totally cleansed of transgression. The Rashban explains (OC 210) that throwing something into the water is a symbolic enactment of the verse in Michah: “Cast into the depths of the sea all of their sins.” He further notes that a precursor for our current Tashlich ritual originated in Biblical times as found in the book of Nechemiah. G-d shake out all those who shall fail to abide by this promise...” (Nechemyah 5:13). Tashlich teaches us that whatever sins come to us through the temptations of daily life, acts of arrogance, fits of anger, moments of weakness, or times of despair, none of these transgressions become part of ourselves. Just like they aren't what we really want to be, they never become who we are. They remain a superficial coating that can be scrubbed off, disowned, and cast away at any time. Tashlich teaches us that we can change and improve, because at our core we are holy and pure – a spark of the Divine. When gazing mindfully at the calming, rushing waters, we may begin to comprehend Hashem’s immeasurable and limitless love for us, calling us to return in complete teshuva. In accordance with the “eco-kosher” perspective of Tashlich, rather than “throwing away,” we actually recycle our sins. Today, it is impossible to throw anything away, as there is no longer any place called “away.” If instead, we cast our mistakes or transgressions to be neutralized, to become biodegradable, we will be able to recycle them without causing pollution. When we think about what we learn from each mistake thrown into the waters, we are able to “recycle,” and transform its potential for mitzvot. Tears are our emotion recycled through water. The waters of Tashlich symbolize the environment in which we recycle our unresolved situations or relationships. 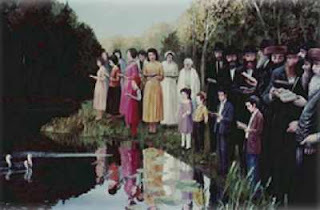 Tashlich is recited near a body of water that contains fish. In Kitzur Shulchan Aruch 129:21, it states “Just as fish are caught in the net, we are caught in the net of death and judgment.” Seeing fish, during Tashlich, therefore awakens us to teshuva, by reminding us that our life is full of traps and temptations. Just as fish are prey to nets and hooks, so too, are we in danger of the hooks of the yetzer hara. If we fail to watch our conduct, we may be caught in a net of troubles. Ultimate freedom from these hooks and nets of transgression lies in sincere repentance. The Rema in Darkei Moshe (OC 583) states that fish represent the bracha that B’nei Yisrael should be fruitful like fish who lay many eggs. Just as fish are submerged under the water, and protected from ayin hara, so too do we pray that Hashem protect us from the evil eye. Since fish do not have eyelids, their eyes are always open. We pray that the eternally compassionate eye of G-d will always protect and watch over us. Although nothing can be hidden from G-d, we gain hope from our faith in Him, who never sleeps. While standing before water containing fish during Tashlich, we remind ourselves of Rabbi Akiva’s teaching, “Just like the fish cannot live without water, so can Israel not live without Torah.” We, moreover, pray that Israel merit favorable judgment due to our thirst for Torah learning. The midrash teaches: “Just as fish who live in water nevertheless drink with thirst every drop of rain that falls as though they never had tasted water before, so too, Israel who thrive on the waters of Torah, nevertheless drink with thirst each new saying of Torah” (Midrash Rabah, Parashat Yayechi). Torah is compared to water as nothing can grow without water. Water actualizes all the potential hidden in the earth. Rabbi Shlomo Carlebach asks, “Why doesn’t the earth sprout forth without water?” The reason is that the water tells the earth: “You know what you have in you? You have so much inner potential, so many treasures” All that is lacking in all those people that still didn’t grow and find the strength to change, is just a bit of water. On Rosh Hashana we ask Hashem, “Master of the Universe, transform me to a drop of water, so that I can tell everyone how much goodness is hidden within them. So I can help them grow nicely.” Many of our mistakes derive from the fact that we are not flowing זורמים. There are a lot of great, sweet people, but everything by them comes in attacks, like a small goodness attack, a small Judaism attack, a small holiness attack. What about becoming easygoing and flowing like water? When we go down to the water, we mamash pray very strongly: “Master of the Universe, please let our lives flow, please let our love flow, please let our Judaism flow! Through the Tashlich, we reverse the way of Narcissus, who falls in love with his own image. We throw into the water shards of our broken heart, which are its imperfections. Our heart then remerges into a greater whole as “nothing is more whole than a broken heart...” Water – Mayim is intrinsically connected with heaven – Shamayim. We pray that our prayer arrives at the very deepest, highest place of reunion between the lower and upper waters, in the Oneness beyond the duality of creation.